Despite his claims to the contrary, there is documentary evidence that George H. W. Bush was in Dallas on Nov. 22, 1963, and was affiliated at that time with the CIA, despite protests that he was not associated with the agency until President Gerald R. Ford appointed him director in 1976. Two FBI memos and a photograph of a man standing outside the Texas School Book Depository are among the intriguing items addressed in Jerome Corsi’s new book “Who Really Killed Kennedy”. The evidence is significant as Corsi broaches the question asked by some researchers of the assassination: Was John F. Kennedy the first presidential victim of the emerging “New World Order” championed by former CIA directors Allen Dulles and George H. W. Bush? The New World Order view pursued as U.S. foreign policy by Allen Dulles and his brother John Foster Dulles, as secretary of state under Eisenhower, Corsi writes, envisioned employing U.S. military action to preserve U.S. business interests, whether or not it was truly in U.S. national security interests. 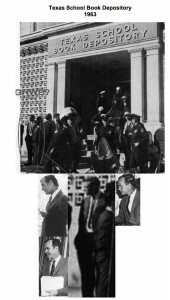 The photograph, widely circulated on the Internet, shows a man with his hands in his pockets on the street by the front doorway of the Texas School Book Depository in the immediate aftermath of the JFK shooting who bears a resemblance to George H. W. Bush. No positive identification of the man has been made. On Wednesday, Nov. 20, 1963, an advertisement under “Club Activities” was published in the Dallas Morning News stating that George Bush, president, Zapata Off-Shore Co., would be speaking for the American Association of Oilwell Drilling contractors at 6:30 p.m., the next day at the Sheraton-Dallas Hotel. 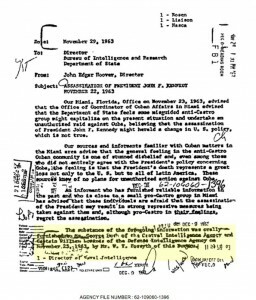 In the last paragraph of the memo, Hoover noted that “Mr. George Bush of the Central Intelligence Agency” furnished the background information contained in the report. Spokesmen for George H.W. Bush have said the reference might be to a different George Bush. “George William Bush,” a person with a different middle name from the future president, was a CIA employee at the time of the JFK assassination. However, George William Bush submitted a statement in a legal action before the U.S. District Court for the District of Columbia stating that he reviewed the memo in question and Hoover was not referring to him. In his signed statement, George William Bush noted he had carefully reviewed the FBI memo written by the FBI director, dated Nov. 29, 1963. He stated he did not recognize the contents as information furnished to him orally or otherwise while he was at the CIA. Thus, he concluded, he was not the George Bush of the CIA referenced in the memo. 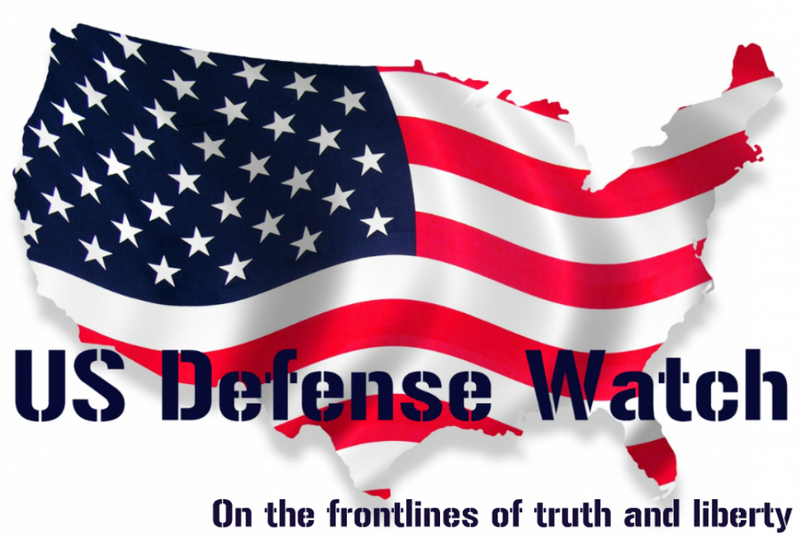 Mark Lane, in his 1991 book “Plausible Denial: Was the CIA Involved in the JFK Assassination,” noted that Joseph McBride, the journalist who found the memo, also tracked down George William Bush, who he described a a lower level researcher at the CIA. McBride said George William Bush also denied he was the person mentioned in the memo. 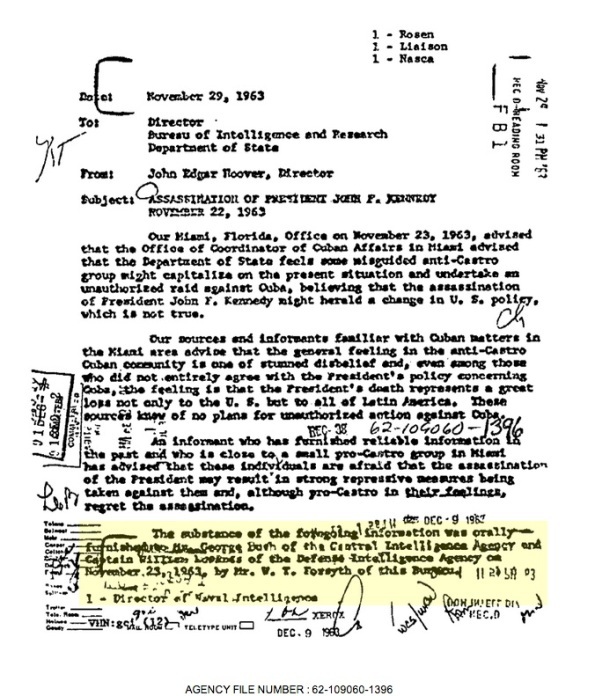 Was George H. W. Bush the “George Bush” in the memo? If so, what precisely was the relationship with the CIA? 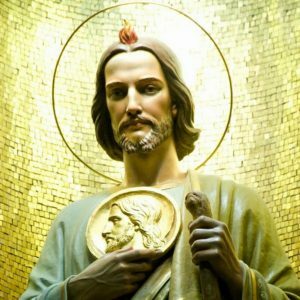 In 1963, was he a CIA agent or merely a CIA asset? When the memo surfaced, the New York Times questioned Stephen Hart, then a spokesman for Vice President Bush, and asked when George H. W. Bush first joined the CIA. Hart replied that Bush denied any involvement with the CIA before President Ford named him director in 1975. 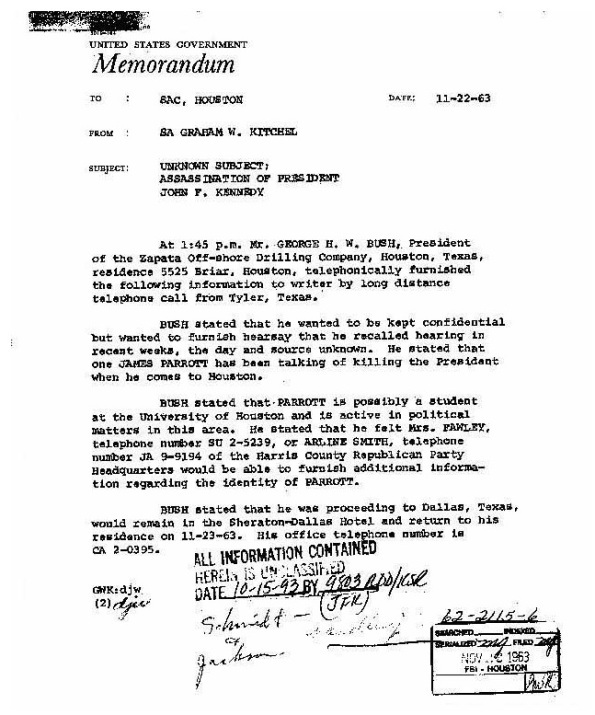 A second recently disclosed memo supports the conclusion that George H. W. Bush was in Dallas the day JFK was assassinated. FBI Special Agent Graham Kitchel wrote the memo to the FBI’s Houston bureau, dated Nov. 22, 1963, the day of the assassination. Tyler is a small town about 100 miles east of Dallas. Graham then relates that Bush suspected a James Parrott, a student at the University of Texas, had been talking of assassinating JFK when the president came to Houston. The lead turned out to be inconsequential. But in the last paragraph, Graham confirmed that Bush was going to be at the Sheraton-Dallas Hotel in Dallas on the day of the assassination, returning to his residence in Houston the next day. Some researchers – noting the discrepancy that the Dallas Morning News claimed Bush would be at the Sheraton-Dallas on Thursday night, Nov. 21, 1963, while the Kitchel memo suggests Bush would be at the hotel on the night of the assassination – have speculated that Bush made the call to establish an alibi. Baker argued the truth was Bush had already stayed at the Sheraton in Dallas on Thursday, as the Dallas Morning News ad stated. 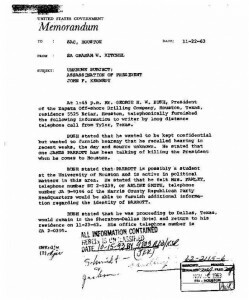 A phone call to the FBI stating he was planning to go to Dallas would create a misleading paper trail suggesting that his stay in Dallas was many hours after the assassination, rather than the night before, since the phone call could have come from anywhere. 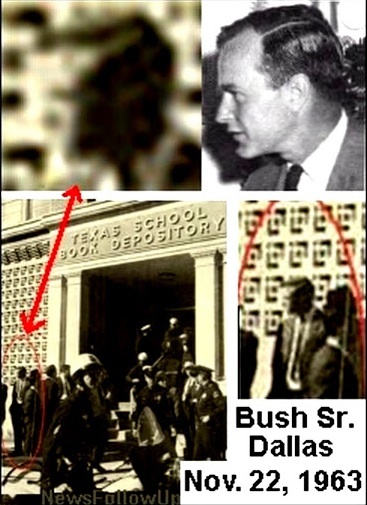 Perhaps Bush called the FBI because he became concerned he had been photographed in front of the Texas School Book Depository in the moments immediately after the JFK shooting. Bush has been vague about where he was when he first learned JFK had been shot, a moment virtually every American old enough to remember has fixed in their minds. 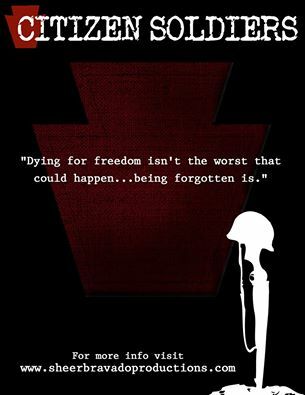 in my humble opinion, with hindsight being perfect, the so called pinko nay rose red, or more accurately described bloody red elements in our country accomplished a coup d’erat that day…….everything went dark and evil, ugly, sad, wrong hearted and soulless in our country, it’s obvious to those that witnessed it first hand and were also old enough to understand but not privy to the big picture. connect the dots. 28Oct62,,,,the cuban missile crisis was over,,,,,friends, please youtube JFK’s finest speech,,,,THE PEACE SPEECH, at american university, which many say was his finest and honor his spirit which will never die.